An Bord Pleanála has granted planning permission for the development of 100 houses and 200 apartments beside St Anne’s Park. A NUMBER OF High Court challenges have been brought against An Bord Pleanála’s decision to grant planning permission for a development of 100 houses and 400 apartments on a site beside St Anne’s Park in north Dublin. 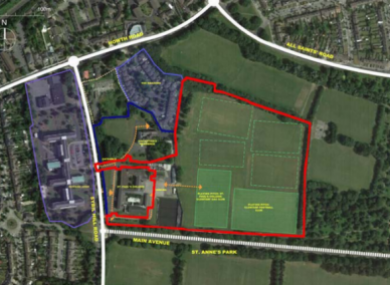 Crekav Trading, part of developer Marlet, has proposed building 104 houses and 432 apartments on lands used by St Paul’s College, in Raheny as six playing pitches. Permission, which is subject to more than 20 conditions, for the project was granted by the board in early April. At today’s vacation sitting of the High Court, three actions aimed at quashing that decision were briefly mentioned before Justice Tony O’Connor. The cases were formally opened in order to comply with the strict legal time limits allowed to those who want to have planning authority’s decisions judicially reviewed by the High Court. The actions have been brought by parties including a group representing residents from Clontarf and veteran environmental campaigner Peter Sweetman. As well as seeking orders quashing the board’s decision a declaration is also sought from the court that the site is designated a Special Protected Area. The actions are against the Board, as well as the Minister for Culture, Heritage and the Gaeltacht, Ireland and the Attorney General. Other entities including the developers of the proposed sites are notice parties to the proceedings. Barrister Eamon Galligan SC for the residents said part of the resident’s action was being brought on environmental grounds, including issues on the EU Habitat’s Directive. Justice O’Connor adjourned the cases, which will all be mentioned when the courts return from their break later this week. The land, the subject of the proceedings, was formally owned by the Vincentian Fathers, who are the trustees of the all-boys secondary school St Paul’s College. Local sports club have also used the pitches. In its decision, the board found the proposed development “would constitute an acceptable residential density in this suburban location and would not seriously injure the residential or visual amenities of the area”. The application for permission to build development was made directly to An Bord Pleanála under a fast-track process for large housing projects, bypassing the local authority which in this case was Dublin City Council. Email “Number of High Court challenges brought against housing development beside Dublin park”. Feedback on “Number of High Court challenges brought against housing development beside Dublin park”.